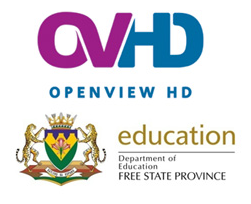 OpenView HD and the Free State Department of Education have joined forces to bring educational channels to 10 schools in the province. The launch of this new learning capability is scheduled for 1st March 2014 in Witsieshoek. The MEC of Education, Mr Tate Pule Makgoe will be joined by MD of Platco Digital Mr Maxwell Nonge to turn on the learning channels; Da Vinci Learning, Mindset TV andeToonz+ for surrounding schools, at the Tseki School. This outreach program will touch the lives of 4327 scholars across the 10 schools chosen in the Free State province. The 10 schools that will receive the decoders are: Sekgutlong Secondary School, Albert Moroka High School, Sibonakaliso Intermediate Farm School, Majweng Primary Farm School, Mampoi Secondary School, Manthatisi Secondary School, Unicom Primary School, Kgotsofalo Intermediate School, Bainsvlei Combined School, and Tseki Secondary School. Mindset TV is designed for teachers and learners in class. These are carefully scaffolded to teach concepts “from the ground up” showing experiments, demonstrations and real life applications. They offer the full syllabus for the year including English, Mathematics, Life Orientation,Life Sciences and many more. Da Vinci Learning is a show made for kids, by kids featuring presenters aged between eight and eleven years. In each episode, their young team take the viewers on a journey into their lives by demonstrating how to cook, garden, do science and make stuff their way. While the show is fun, energetic and charming, the content is devised so that it’s also educational. One of their shows, All For Kids, demonstrates that “even if you’re small, you can still have big ideas”. Educating the nation has always been a driving factor in poverty eradication in South Africa. With Da Vinci Learning and MindsetTV learning channels, OpenView HD aims to improveliteracy levels within SA, while making it fun for scholars to learn. With a key focus on primary schools, this initiative is sure to lay a strong foundation of success for learners and generations to come. “OpenView HD is honoured to collaborate with the Department of Education in offering innovative solutions to our education challenges. The Mindset TV and Da Vinci Learning channels have taken the best practise in teaching, and applied it to their broadcast offering. We have no doubt that our educational offering will be a game-changer in these young learners education,” comments MD of Platco Digital, Mr Maxwell Nonge. “Advanced technology makes it possible for learners especially in rural areas have access to quality education and improves results,” says MEC Tate Makgoe. “Mindset Network has created over 1800 hours of curriculum aligned curriculum aligned, classroom and revision resources content, we are excited that learners and teachers from the rural Free State schools will now have access to our educational television channel. Our content is not only designed to assist teachers to explain difficult concepts in the classroom, learners can also watch our revision broadcast after school, on weekends and during school holidays. The newly connected learners will now join thousands of learners who watch our educational channel and interact with presenters and their peers through our popular Facebook platform, which has over 66,000 followers.” Mindset Network CEO, Mr Roith Rajpal. This new advancement will see learning in South Africa taking a giant leap forward, and giving rural disadvantaged school equal opportunities for a better future. Mindset TV embraces all things learning: from complex mathematics to changing a light bulb to how to balance your cheque-book. With Mindset TV everyone can learn something new, today and every day! The new Mindset TV channel is the channel of choice for information, innovation and education. Mindset is Afro-centric and offers mainly locally-produced programming. Mindset TV is all about connecting to communities. Da Vinci Learning is an innovative and unique educational television channel that aims to bring curious minds of all ages together to celebrate the lifelong journey of learning. Reaching millions of viewers around the world, Da Vinci Learning offers a wide array of programmes, all of which meet our high standards for quality, family-friendly content. Curated with the entire family in mind, the Da Vinci Learning channel offers something for everyone. Our philosophy is centred around the idea of seamless learning, the belief that learning is a lifelong journey that hinges on participation, engagement, and, most importantly, fun! eToonz+ is a brand new channel from e.tv, is the destination of choice for free quality kids entertainment – where exciting tales create endless adventures!